The Hi-T Pigalert also known as ‘Pig Signaller’, ‘Pig Detector’ & ‘Pig Passage Indicator’ is a bi-directional intrusive devices attached to the pipeline via a Weld-on Base or Flange and available up to ANSI 2500 (6170 psi). A trigger protrudes slightly into the line enough to come into contact with a pig or sphere, but have little to no effect on flow. All models are set with line specific trigger lengths, but can be easily set to suit varying thicknesses of pipeline of any diameter on site. Upon the pig or sphere striking the trigger the Hi-T signals the user the pig has crossed the point via a mechanically operated signal flag, electrical auto resetting switch or both. Hi-T units are classified in two styles: those models which are not designed for removal while the line is under pressure and those models which are fitted with an integral valve and suitable for controlled removal when the pipeline cannot be de-pressurized. 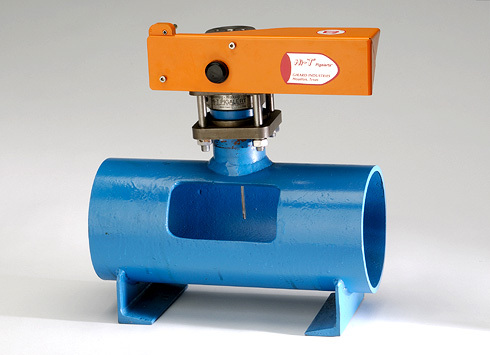 For these valve models a simple jacking bracket tool is available for this purpose. Consisting of a safety screw mechanism and bridging clamps it facilitates the removal and re-installation of the Pigalert from the line under pressure in a matter of minutes.